A candlelit table, red roses, soft background music, delicious smells wafting from the kitchen, and a bottle of wine all convey imagery of a romantic dinner with your special someone. However, the meal itself is only part of the romance. 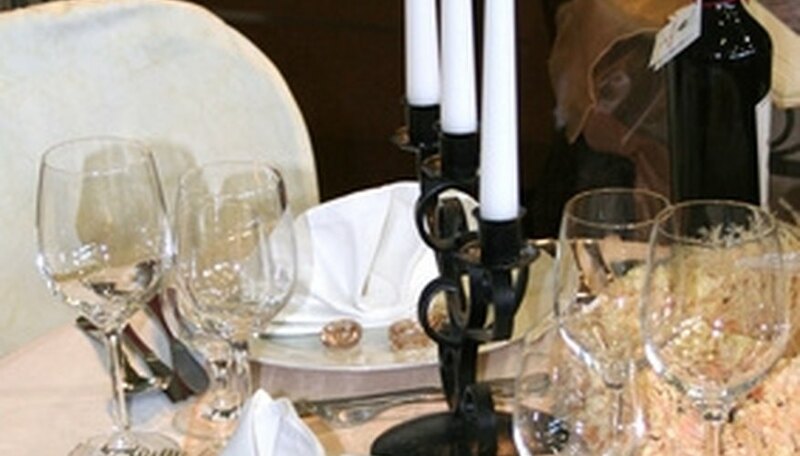 Sending a creative and amorous dinner invitation to your loved one can set the mood for the evening to follow. Sending an amorous invitation to your loved one heightens the romance. For an impromptu romantic invitation, wait until your significant other is in the shower. Sneak in quietly and write him a note in the steam on the bathroom mirror. Keep it simple but be sure to include time, place, and plenty of hearts, "X's," and "O's" in your note. In today's busy buzz of technology and email, receiving a handwritten invitation in the mail smacks of classic romance. Include some original poetry or borrow verses from your favorite poet or author. For an extra romantic twist, mail your invitation to her place of business and not your shared address. A gift delivery included with your dinner invitation can grab your sweetheart's attention and kick off a romantic evening. Send him a beautiful floral arrangement or gourmet treat with a note outlining all the details of your special dinner date. Or send him personalized M&M's with your dinner invitation message written on the candies themselves. Cortney Farmer began her writing career in 2010 after leaving the corporate workforce. Her articles appear on eHow and Answerbag. Farmer has a Bachelor of Science in speech pathology and English from the University of Massachusetts. Farmer, Cortney. "Ideas for a Romantic Dinner Invitation." Dating Tips - Match.com, https://datingtips.match.com/ideas-romantic-dinner-invitation-6589122.html. Accessed 19 April 2019.